The fibula (/ˈfɪbjᵿlə/) or calf bone is a leg bone located on the lateral side of the tibia, with which it is connected above and below. It is the smaller of the two bones, and, in proportion to its length, the slenderest of all the long bones. Its upper extremity is small, placed toward the back of the head of the tibia, below the level of the knee joint, and excluded from the formation of this joint. 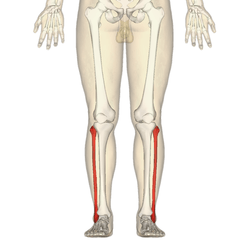 Its lower extremity inclines a little forward, so as to be on a plane anterior to that of the upper end; it projects below the tibia, and forms the lateral part of the ankle-joint. The upper extremity or head of the fibula is of an irregular quadrate form, presenting above a flattened articular surface, directed upward, forward, and medialward, for articulation with a corresponding surface on the lateral condyle of the tibia. On the lateral side is a thick and rough prominence continued behind into a pointed eminence, the apex (styloid process), which projects upward from the posterior part of the head. The prominence, at its upper and lateral part, gives attachment to the tendon of the biceps femoris and to the fibular collateral ligament of the knee-joint, the ligament dividing the tendon into two parts. The remaining part of the circumference of the head is rough, for the attachment of muscles and ligaments. It presents in front a tubercle for the origin of the upper and anterior fibers of the peroneus longus, and a surface for the attachment of the anterior ligament of the head; and behind, another tubercle, for the attachment of the posterior ligament of the head and the origin of the upper fibers of the soleus. The body of the fibula presents four borders - the antero-lateral, the antero-medial, the postero-lateral, and the postero-medial; and four surfaces - anterior, posterior, medial, and lateral. The antero-lateral border begins above in front of the head, runs vertically downward to a little below the middle of the bone, and then curving somewhat lateralward, bifurcates so as to embrace a triangular subcutaneous surface immediately above the lateral malleolus. This border gives attachment to an intermuscular septum, which separates the extensor muscles on the anterior surface of the leg from the peronaei longus and brevis on the lateral surface. The antero-medial border, or interosseous crest, is situated close to the medial side of the preceding, and runs nearly parallel with it in the upper third of its extent, but diverges from it in the lower two-thirds. It begins above just beneath the head of the bone (sometimes it is quite indistinct for about 2.5 cm. below the head), and ends at the apex of a rough triangular surface immediately above the articular facet of the lateral malleolus. It serves for the attachment of the interosseous membrane, which separates the extensor muscles in front from the flexor muscles behind. The postero-lateral border is prominent; it begins above at the apex, and ends below in the posterior border of the lateral malleolus. It is directed lateralward above, backward in the middle of its course, backward, and a little medialward below, and gives attachment to an aponeurosis which separates the peronaei on the lateral surface from the flexor muscles on the posterior surface. The postero-medial border, sometimes called the oblique line, begins above at the medial side of the head, and ends by becoming continuous with the interosseous crest at the lower fourth of the bone. It is well-marked and prominent at the upper and middle parts of the bone. It gives attachment to an aponeurosis which separates the tibialis posterior from the soleus and flexor hallucis longus. The anterior surface is the interval between the antero-lateral and antero-medial borders. It is extremely narrow and flat in the upper third of its extent; broader and grooved longitudinally in its lower third; it serves for the origin of three muscles: the extensor digitorum longus, extensor hallucis longus, and peroneus tertius. The posterior surface is the space included between the postero-lateral and the postero-medial borders; it is continuous below with the triangular area above the articular surface of the lateral malleolus; it is directed backward above, backward and medialward at its middle, directly medialward below. Its upper third is rough, for the origin of the soleus; its lower part presents a triangular surface, connected to the tibia by a strong interosseous ligament; the intervening part of the surface is covered by the fibers of origin of the flexor hallucis longus. Near the middle of this surface is the nutrient foramen, which is directed downward. The lateral surface is the space between the antero-lateral and postero-lateral borders. It is broad, and often deeply grooved; it is directed lateralward in the upper two-thirds of its course, backward in the lower third, where it is continuous with the posterior border of the lateral malleolus. This surface gives origin to the peronaei longus and brevis. An avulsion fracture of the head of the fibula refers to the fracture of the fibular head because of a sudden contraction of the biceps femoris muscle that pulls its site of attachment on the bone. The attachment of the biceps femoris tendon on the fibular head is closely related to the lateral collateral ligament of the knee. Therefore, this ligament is prone to injury in this type of avulsion fracture. The word fibula can be dated back to c. 1670 to describe a clasp or brooch – see fibula (brooch) – and was first used in English for the smaller bone in the lower leg c. 1706. It derives from Latin fībula, also meaning a clasp or brooch. The bone was so called because it resembles a clasp like a modern safety pin. ↑ Bojsen-Møller, Finn; Simonsen, Erik B.; Tranum-Jensen, Jørgen (2001). Bevægeapparatets anatomi [Anatomy of the Locomotive Apparatus] (in Danish) (12th ed.). pp. 364–367. ISBN 978-87-628-0307-7. ↑ Gottsegen, CJ; Eyer, BA; White, EA; Learch, TJ; Forrester, D (2008). "Avulsion fractures of the knee: imaging findings and clinical significance.". Radiographics. 28 (6): 1755–1770. doi:10.1148/rg.286085503. PMID 18936034. Diagram which depicts ossification of human fibula. Lower extremity of right fibula. Medial aspect. Knee and tibiofibular joint.Deep dissection. Anterior view. Wikimedia Commons has media related to Fibula (bone). Look up fibula in Wiktionary, the free dictionary.